Last June, StogieGuys.com named its first series of Gold Star Smokes. Each of us chose cigars we believed, for one reason or another, were worthy of strong recommendations. They didn’t necessarily have to be five stogie-rated – just commendable smokes we turn to time and again for high quality and consistency. For Patrick A, it was the Rocky Patel Vintage 1992 Torpedo; Patrick S bestowed his honor on the El Rey Del Mundo Robusto Larga; and George E selected the Punch Champion. 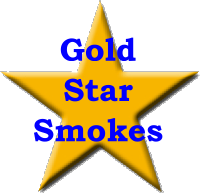 Now we’re back with three new Gold Star Smokes. We think they are well worth your attention, and we’d love to hear what you think. Last fall was my first run-in with an EO 601 Serie “Green” La Fuerza, and I’ve made sure to have many more since. This dark, oily cigar is hearty and complex with delicious notes of leather, clove, and cocoa bean. The $7 cost is more than fair, especially since the delicious flavors are accompanied by a straight burn, a smooth draw, and a firm ash. Just make sure to try this on a full stomach. I’ve been fortunate enough to smoke a handful of Montecristo Petit Edmundos in the past six months, and I’ve thoroughly enjoyed every one. With classic looks and a complex blend of cedar, spice, earth, warm tobacco, and a medium- to full-bodied creaminess, it is no surprise that this cigar was given a five stogie-rating by my colleague Patrick A. It also earns points for being available – though not in the U.S. of course – for under $8 when purchased by the box. However, what really earns this Cuban smoke its “gold star” is its stubby size (4 1/3″x 52) , which showcases the exciting flavors in a formate you can enjoy in 45 minutes. Recent unexpected circumstances have put me once or twice a week at a local cigar shop that I had only visited occasionally in the past. Each time there I’ve lit up a Cuban Crafters Cameroon Robusto, and each time I’ve thoroughly enjoyed it. The five inch by 52 ring gauge cigar burns well, draws great, and produces thick, tasty smoke with a sweet, woodsy finish. If you like Cameroon tobacco, this is one you won’t want to miss. At about $3 a stick, it’s also an incredible bargain. I'm glad to see the EO 601 make this list. Those Green labels are strong but extremely tasty and flavorful. Great list.